(Reuters) - A strike at Canadian Pacific Railway Ltd, Canada's second biggest railway, won't end until Friday at the earliest after the Liberal opposition in Parliament said it would follow rules that would delay passage of back-to-work legislation. 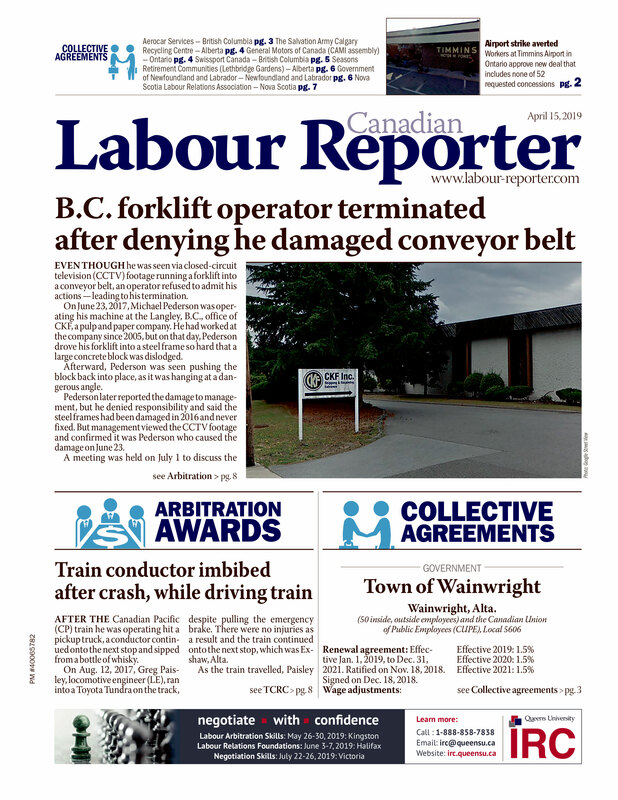 The House of Commons passed the Conservative government's bill in the early hours of Wednesday, as the nationwide work stoppage by members of the Teamsters union idled CP freight shipments for an eighth day. Labour Minister Lisa Raitt had said she hoped train service would resume on Thursday, but that target became unreachable with the Liberals preventing the Senate from taking up the bill immediately. Raitt said service could not resume on Thursday unless the Liberals change their minds. "The clock is ticking, and it's on their conscience, these senators who have determined that they're not going to help us with back-to-work legislation," she told reporters. She said she had no idea when trains could start rolling again but said it was possible on Friday if the Senate passed the bill at all stages on Thursday. Raitt later asked both sides to go back to work before the legislation received final approval. "It's always in the hands of the parties to return to work so ... I'm asking CP Rail and the Teamsters to voluntarily return to work on Friday knowing they have to get their operations up and running," she told reporters. Liberal Senate leader James Cowan will not let the upper house take up the measure right away, according to party spokesman Marc Roy, and leader Bob Rae said he would insist that the upper house take the time to bring in witnesses. Because of the Conservative majority in the Senate, the bill's passage is assured, but opposition senators must agree to waive normal rules if it is to be fast-tracked. The New Democrats and the Liberals have criticized Ottawa for repeatedly stepping in to halt strikes, saying the government was trampling on workers' rights. The Conservatives say their actions are needed to protect a fragile economy still emerging from recession. The strike has stopped CP's freight operations across Canada since May 23 when 4,800 unionized locomotive engineers, conductors and rail controllers walked off the job over the company's plan to cut pension payments. With their products stranded in warehouses and silos or on the railroad's tracks, CP's customers have urged the government to end the strike. Ottawa did not need much prodding and introduced the back-to-work bill on Monday. Raitt has said a strike at CP would cost $540 million in economic activity each week. Honda Motor Co Ltd, which assembles vehicles in Ontario, said it had to cut overtime work as it tries to balance production with the firm's capacity to store vehicles. "Until CP resumes normal operations, Honda is not able to ship vehicles out by rail," said spokeswoman Maki Inoue. The Liberals will allow debate to begin on Thursday in the Senate. If it passes the bill later that day, its provisions would take effect 12 hours later, meaning workers won't have to report back to their jobs until Friday. Roy challenged the idea that the Liberals were delaying the bill, since formal rules provide for bills to be taken up only two days after passing the House, and the party was allowing that to be shortened to a single day. Raitt said there was a tradition of letting rush legislation to go through the Senate within a day of passing the House. "It's irresponsible. It's outrageous," Raitt said of the Liberal tactics, saying they would cost the economy $80 million a day. The striking Teamsters workers have been without a contract since December 31, 2011. The main disagreement is over CP demands to cut back on pension costs. The back-to-work bill makes provision for Ottawa to appoint an arbitrator, who has 90 days to work with both parties to craft a compromise contract, which will then be imposed. The strike comes at a difficult time for CP, whose chief executive and chairman quit less than two weeks ago after losing a boardroom dust-up with the company's largest shareholder. The shareholder, Pershing Square Capital Management, has vowed to improve CP's operating performance, which is the weakest in the industry.